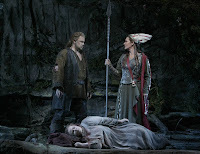 After 22 days of the 2009 Ring cycle and caption writing, we bring our contest to a close. Our final "Ho Jo To Ho" t-shirt goes to Rob Falconer (email us to learn how to claim your prize) for his caption, "Can somebody please help me get this coat hanger out?" Thank you to all who made contributions and kept us laughing; we've loved reviewing your submissions every day!! The caption contest will return for each of our remaining productions this season with more prizes to be won - stay tuned! "This? I stole it from some dumb kid, I think his name was 'Parsifal'. Boy, was he ticked." "For Heaven's sake, kid, I said bring me a BEER!" "Lawn Darts, Version 1.0. A fun time for the whole family!" "No, you idiot, it's knit one, purl two!" "Siegfried, I want to "PUMP YOU UP'!" "C'mon to me ladies, I CAN hug you both!" "My dad went to Valhalla and all I got was this lousy ring." "Melt in your mouth not in your hands!" "...and when I pull THIS string, it makes his eyebrows go up and down!" "For my next trick I'll pull a RABBIT out of his other ear!" "Look! They finally got the 787 off the ground!" "Let go. I promise you that if a tree falls in a forest, no one will hear it." "Always a bridesmaid and never a bride!" "You sure you don't have swine flu?" "I love her, I love her not, I love her, I love her not..."
"Family weekend in Valhalla: $750. Tailored muscle suit: $500. The look on your brother's face when you acquire the Ring to Rule Them All: Priceless." "Hold it! I think Hagen's batteries have run out again." "Wotan! Instead of whips and spears, many mortal parents are using a punishment called "time-out"..."
"It says it right here on the blade. 'Made in China.'" "Can somebody please help me get this coat hanger out?"